Recently, I have been inexorably drawn to the work of Bill Griffith, Robert Crumb, Aline Kominsky Crumb, Justin Green and Art Spiegelman, among others. Part of the fascination has something to do with all of these people having lived in San Francisco when the city was first becoming a freak magnet. What will do when all of our aging hippies have disappeared? Sure, there will remain a younger generation of patchouli-scented love children with dreadlocks and Bohemian skirts, paired with their dope-smoking radical-subversive boyfriends who play the bongos. But it’s not the same. They won’t have been there when it all began. This week, I finished reading Need More Love (MQ Publications, 2007) by Aline Kominsky Crumb. This is a memoirist’s memoir—Kominsky Crumb didn’t just decide to look back on her life once reaching a certain age of maturity (you should go to a local Writer’s Society meeting! You’ll understand what I mean), she diligently documented her life as it was unfolding before her eyes. The comics included in the volume date back as early as 1976. Kominsky Crumb acknowledges the influence and inspiration of Justin Green’s “Binky Brown Meets the Holy Virgin Mary,” the first comic artist to work within the graphic memoir form. Kominsky Crumb assumes the proud moniker of being the first woman artist to follow in Green’s footsteps. She was involved in the earliest meetings of Wimmen’s Comix in 1971, inspired by the charismatic leadership of Trina Robbins, who incidentally despised Robert Crumb. Robbins was critical of Aline Kominsky for her involvement with Crumb, for what was argued to be his misogynistic portrayal of women in his work. Later, Kominksy Crumb was also involved in the development of Twisted Sisters Comics. 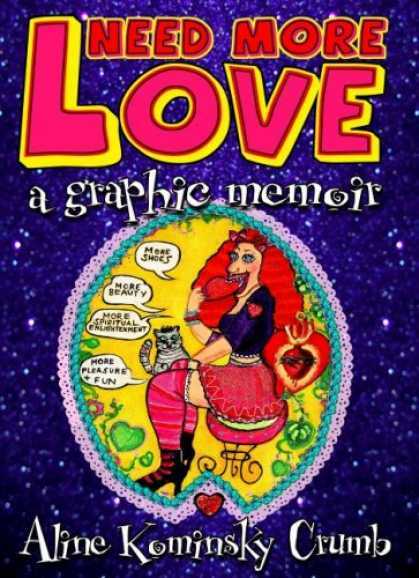 Need More Love is infused throughout with commentary and photographs on various phases in the author’s life, which provide further rich background information and insights into her comics. Each chapter includes an introduction designed to supplement the illustrations that follow. The comics that Aline and Robert co-author are ingenious; they are a demonstration-in-action of the complicity and affection that the two share for one another. Aline draws herself in the shared strips, and Robert does the same. In one comic, which must have been produced when Sophie Crumb was around eleven years old, she even draws herself! The end of the memoir includes “Unlocking the Kominsky Code,” the transcription of an extensive interview between Aline Kominsky Crumb and Zaro Weil, the publisher of Need More Love. The interview situates the author in the relatively recent present; she is invited to reflect on being a member of the post-war Baby Boomer generation, and stresses the importance of having been part of a youth culture that rebelled against the conservative mores of the time. Kominsky Crumb draws a parallel between the Bush-era backlash of the religious right, and the McCarthy regime that dominated mainstream 1950s America. She diagnoses the prevailing illness of western society to be shopping, but obviously has a soft spot herself for shoes and designer clothing labels. Kominsky Crumb emphasizes the free will that she exercises in choosing her outfits, not necessarily falling victim to the dominant trends of the day. Clearly, wearing clothes is a creative act for her. Perhaps even more important than her personal style in fashion, Kominsky Crumb’s comics convey the artist’s ability to communicate tremendous self-awareness and complex emotions in her work. Beyond comics, Kominsky Crumb also includes photographs of her paintings, her shrine-installations and revealing snapshots of the (busy!) interior of the fifteen-bedroom chateau that she shares with her husband R. Crumb in southern France. For all of the truthfulness in Kominsky Crumb’s insights, it’s hard to reconcile her opinions about the materialist values of the nation with her own consumer behaviours. She does point towards the revolutionary tendencies of the French compared with the complacency of Americans, and the family’s moving to France was inspired by Robert and Aline’s disgust with the changes that they witnessed over the years to their home surroundings in Winters, California. The area grew from having three churches when the couple first settled down to an astounding thirteen churches by 1990, with the ten new churches all being evangelical denominations. Much of “Unlocking The Kominsky Code” focuses on the author’s ability to have given up on many of the addictions that defined her habit-forming tendencies in the past. Admirably, Aline Kominsky Crumb seems to have discovered an equilibrium to her life, which, as she describes in her introduction, has led to experiencing so much love, she now feels she has to share it with everyone else! a story of two husbands! As is the case with so many great graphic memoirs, the greatest strengths of Need More Love are its accessibility. Kominsky Crumb’s storytelling makes you want to be her friend, precisely because she is so generous in sharing her weaknesses and desires with the reader. In one passage, she describes her drawing as “scratchy” and “ugly” (176). Well, it ain’t no Michelangelo, but on the other hand, reading a memoir like this makes me think that maybe I could do it myself! After years of not confronting the fear of failure, I can only commend Kominsky Crumb on her fearlessness and shamelessness. Her self-deprecating humour brings out the fallibility in all of us, and the naïve (in the best sense of the word) quality present in her artwork serves as an inspiration. Oddly, when I did a Web search for MQ Publications and the website supposedly advertising Need More Love, neither URL was live. This would suggest that the publisher is now defunct, which is a misfortune—to have been able to churn out such a fine graphic memoir, I would have hoped that others would follow in its wake.